Background: Herpes zoster (HZ) risk is increased in autologous hematopoietic stem cell transplant (aHSCT) recipients, whose T-cell immunity is compromised. In aHSCT recipients ≥18 years of age (YOA), the adjuvanted recombinant zoster vaccine (RZV) showed 68.2% efficacy against HZ and 89.3% against postherpetic neuralgia [BMT Meeting 2018, abstract #LBA2] and elicited robust immune responses [EBMT 2018, abstract #O111]. T-cell immunity is considered the main mechanism of protection against HZ. Here, we report the varicella zoster vaccine glycoprotein E (gE)-specific cell-mediated immune (CMI) responses and polyfunctionality of CD4+ T cells induced by RZV in this population. Methods: In this phase 3, observer-blind, multicenter study (NCT01610414), adults ≥18 YOA randomized 1:1 received 2 doses of RZV or placebo 1-2 months (M) apart, with the first dose given 50-70 days after autologous HSCT. CMI responses were assessed in a sub-cohort of study participants (according-to-protocol [ATP] cohort for CMI). Peripheral blood mononuclear cells were stimulated with a pool of overlapping peptides covering the entire sequence of gE antigen and the CD4+ T-cell activation markers interferon-γ, tumor necrosis factor-α, interleukin-2, and CD40 ligand were labelled by intracellular staining and analyzed by cytofluorometry. The main assessment of CMI was based on the frequency of gE-specific CD4+ T cells expressing ≥2 of these activation markers (CD4[2+] T cells) per 10^6 T cells. Polyfunctionality was analyzed post-hoc by summarizing the median frequencies of CD4+ T cells expressing 1, 2, 3, or 4 markers. Immune responses were assessed at baseline, 1M post-each dose, 12M, and 24M post-dose 2. Results: Of the 1846 vaccinated participants, 141 (RZV: 71 and placebo: 70) were included in the CMI sub-cohort and 114 (59 and 55, respectively) in the ATP cohort for CMI. In the RZV group, frequency of CD4[2+] T cells was higher at all post-vaccination time points compared to baseline (Figure, Panel A). Vaccine response rate was 92.9% at 1M post-dose 2 and remained above 70% at subsequent time points. 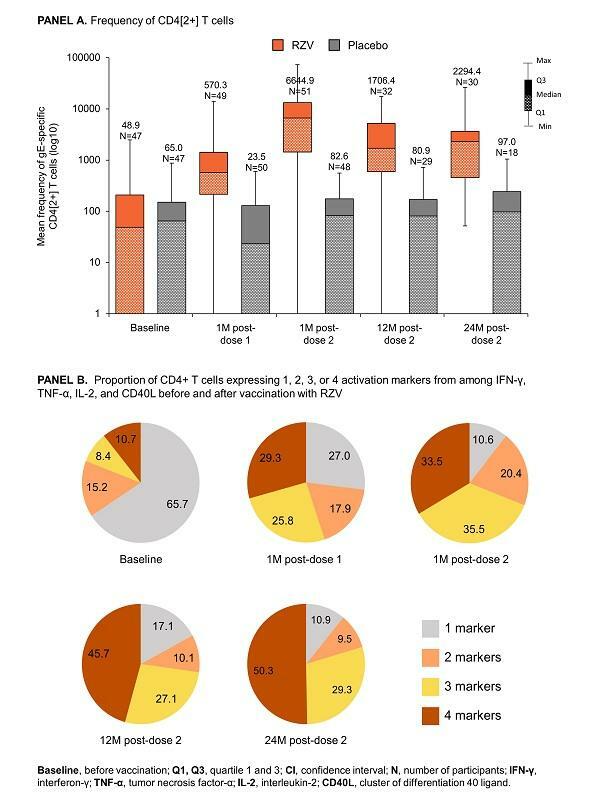 The proportion of CD4+ T cells expressing 4 activation markers increased from baseline up to 24M post-dose 2, while the proportion of CD4+ T cells expressing only 1 activation marker declined and was low 24M post-dose 2 (Figure, Panel B). Conclusions: Two doses of RZV administered to aHSCT recipients shortly after transplantation induced high gE-specific polyfunctional CD4+ T-cell responses, which persisted up to 2 years post-vaccination. This indicates immune memory and represents a novel finding in such an immunocompromised population where CD4+ T-cell polyfunctionality data are scarce. Furthermore, these observed polyfunctional T-cell responses appear comparable to those elicited by RZV in the general adult population ≥50 YOA [Cunningham, JID 2018]. Disclosure: During the conduct of the study, Keith Sullivan reports honoraria from the GSK group of companies. He reports personal fees from Roche Genentech, AstraZeneca, Magenta, and Takeda Millennium, outside the submitted work. Edward Stadtmauer received research funding from GSK group of companies. Adriana Bastidas, Mohamed El Idrissi, and Bruno Salaun are employees of the GSK group of companies and own shares from the GSK group of companies.